Sixers Get Huge Moral Victory in Tough Actual Loss to Streaking Hawks. I think all of us Sixers fans came in to this season thinking we’d settle for moral victories in the absence of actual victories. Well, this game was the most moral-victoryest moral victory of the season. The Sixers battled back from a 21pt first half deficit behind a barrage of 3s, taking a 2pt lead with 3 minutes to go in the game. Ultimately the Hawks poise down the stretch won out as the Sixers fell 91-85. It was the Hawks 19th win in a row, while the Sixers bid for their first 3-game winning streak of the season fell short. Al Horford led the way for the Hawks with a 23pts and 11 boards, including 11pts in the 4th and a huge bucket down the stretch to seal the game. The Sixers had 6 players in double figure scoring and Nerlens Noel had his 7th double double of the season with 11pts and 10rebs. If the Eastern Conference weren’t so damn bad, the Hawks would undoubtedly be the best team in the NBA. They become the first team in the league to notch 40 victories, and their passing and defense was on display all night. Which is exactly why Malik, towards the end of the game, said that he considered this game a win for the Sixers simply because “they got so much better just playing this game.” The Sixers spotted the Hawks a nice 12 pt lead in the first quarter after committing 9 TOs leading to 10 Atlanta points. They only managed 10 pts in the first quarter, and the Hawks seemed to be toying with the Sixers, getting to the rack at will, trapping MCW at the 3pt line, and generally wreaking havoc with the Sixers on both ends of the court. After playing the Hawks close to even in the 2nd quarter, Brett Brown alluded at the half to the idea that the Sixers needed confidence in their game plan and had to take the shots they like. Well ... we know Hinkie, Brown, analytics, et al all like the 3 ball, and thus the Sixers fired up 22 3s in the 2nd half. Ultimately they shot 14-35 from downtown (40%), both their most made and attempted 3s of the season. Hollis Thompson, who hasn’t made more than 2 3-pointers since Dec 12th, went 4-6 from the 3pt line tonight. McDubs and LMAM both dropped two from downtown. But the guy with ice in his veins tonight was Jerami Grant, who went a career best 3-3 from downtown and looked way more confident than he should’ve been. This is a guy who was not rated as a good shooter coming out of Syracuse, but has been silencing the naysayers of late shooting 43% from downtown over his last 10 games to go with some impressive defensive performances. KJ McDaniels was the darling of the drafts 2nd round early this year, but it really is looking like Hinkie got 2 keepers in the second as Jerami’s game comes on. Brett Brown and Hawks coach Mike Budenholzer share a friendship dating back to their shared time as Spurs assistant coaches, and one has to imagine they have a shared philosophy on what the “right way” to play the game is (The Tree of Pop is strong). Watching the Hawks, it’s obvious to see the value they place on playing D and moving the ball. The Hawks are 5th in the league in defensive rating (pace adjusted defense), and lead the league in assisted field goals from both 2pt and 3pt range. Well, those plucky Sixers rank 12th in defensive rating, 11th in assisted 2pt field goals and 2nd in assisted 3pt field goals. Perhaps given a bit more talent and a lot more experience, the Sixers could become a team like the Hawks. Going from 26-straight losses last year to 19-straight wins in the next few years would be quite the feat. For the time being however, the boys from Philly have to settle for a front row seat to one of the best shows in the league. They can take pride in knowing they hung in there with the best. But more important than taking pride is taking notes so that some day soon, we can turn those moral victories into actual victories. Michael Del Zotto scored his fifth of the season. The Flyers killed a late penalty in the third. Steve Mason made 30 saves and the Flyers won their fourth consecutive game as they defeated the Toronto Maple Leafs 1-0 Saturday night at the Wells Fargo Center. It has been quite sometime since we have seen a team mascot roaming around Sixers games. 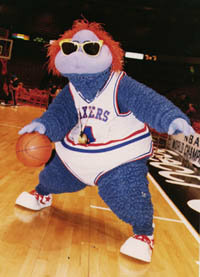 Hip Hop has been gone since 2011 and it finally looks like the Sixers are prepared to reveal their new mascot. According to the press release on Sixers.com, the unveiling will happen at the Franklin Institute on Tuesday, February 10th at 1pm. “From the start, our mantra for choosing a new mascot has been ‘For Kids, By Kids,’ and they have been integral to this entire process,” said Sixers Chief Marketing & Innovation Officer Tim McDermott. “We met with, interviewed and listened to more than 1,000 children in the greater Philadelphia region through focus groups and surveys to bring to life the mascot they wanted. We look forward to introducing the newest member of our team to the public on February 10." The public ceremony will be co-hosted by Sixers CEO Scott O’Neil and In-Arena Host Christian Crosby, who will welcome the new mascot along with hundreds of area children, the Sixers Dancers and Sixers Phlight Squad. During last night's game against Minnesota, the Sixers released a teaser of the new character and he may resemble their old mascot, Big Shot, who has been an after thought since 1996. The Philadelphia Flyers (21-22-7) look to win their fourth straight game and get back to .500 on the season as they play host to the Toronto Maple Leafs (22-24-4) tonight at the Wells Fargo Center. This is the second of three meetings between the two clubs and the lone game in Philadelphia. Game time is 7:00. Every week, you can catch up on all of our stories on Flyerdelphia in our weekly round-up. Here is this week's content from January 24 to 30. The Atlanta Hawks (39-8) and the Philadelphia 76ers (10-37) will go head-to-head tonight for the third of four overall meetings this season. The two teams first met back in Atlanta, where Paul Millsap and former Sixer Kyle Korver led the Hawks with 17 points each to help them to victory. Only one Sixer starter reached double digits in points that game, Luc Richard Mbah a Moute with 12. Michael-Carter Williams nearly had a triple-double, however with 8 points, 10 rebounds and 9 assists. Losing 49-37 at the half, the Sixers were never able to make a comeback as they trailed by double-digits the entire second half home at the Wells Fargo Center. Atlanta center Al Horford recorded a triple-double with 21 points, 10 rebounds and 10 assists. Philadelphia was both out-shot and out-rebounded in the game, 48.3% to 40.8%, and 47-35 respectively. Sixers forward Robert Covington struggled, shooting 0-7 from three-point range, and just 2-13 overall. Michael Carter-Williams led the team with 20 points and 9 rebounds. The Sixers will be looking for their third consecutive win, which would be a season-high. They previously had won two consecutive games against the Nets and Pacers on January 9-10, and against both of Florida's basketball teams, the Magic and Heat, on December 21-23. Philadelphia is coming off of defeating the Detroit Pistons 89-69 on Wednesday, as well as the Timberwolves last night, 103-94, where point guard Michael Carter-Williams recorded his fifth career triple-double (third of season) with 17 points, 10 rebounds and 10 assists. The Hawks have won 18 consecutive games. With a win tonight against Brett Brown's team, their 19-game winning streak would be the fifth-longest in NBA history. Atlanta has won against Philadelphia in six consecutive meetings, where they scored 100+ points in five of the six. This comes after the Hawks lost seven of their previous eight against the Sixers. All-time, the Sixers are 62-107 while playing in the Peach State. Kyle Korver: Shooting 53.4% beyond-the-arc this season, averaging 13.1 points per game and 3.1 three-point field goals in 46 starts. Elton Brand: The former Sixer from 2008-2012 is averaging 3.1 points, 3.0 rebounds, and 12.6 minutes over 16 games this season. Sixers injuries: Joel Embiid (right foot), Jason Richardson (left knee), Tony Wroten (right knee), Andrei Kirilenko (not with team). Matt Rappa (@mattrappa) is a contributor to Sixerdelphia.com. Coming into tonight the Sixers were fresh off a win against the recently hot Detroit Pistons. I'm not sure if anybody predicted a Sixers win, let alone a win by 20. Minnesota came into WFC with an 8-37 record making them one win behind the Sixers. After what was a true back and forth game for the most part, the Sixers pulled away towards the end and got win number 10 on the year beating Minnesota 103-94. Michael Carter-Williams played his heart out, coming up with his 5th career triple-double to the tune of 17 points,10 rebounds and 10 assists. That stat right there is impressive for anyone, and all the more impressive when you’re only midway through your second year. The offense started with him tonight as he facilitated scoring opportunities for all of the players around him including none other than Nerlens Noel. Whether it was driving to the rim hard and kicking it out to the wing for an open three or finding Noel lurking near the rim, MCW was indeed the spark that the Sixers used to get it done tonight. MCW also showed he could score in a hurry when he received an inbounds pass at halfcourt with seconds left, split two defenders, dribbled past another and laid the ball into the hoop all before the buzzer sounded. It was all around one of the best performances to date for the young point guard from Syracuse. Nerlens also made his presence felt by racking up a career high 6 blocks. Not only was he making moves on the defensive end, but he also was finishing off possessions with many baskets near the rim often in the form of dunks. He finished the night off with 14 points, 6 rebounds and 6 blocks. Luc Mbah a Moute led the way with 18 points and Robert Covington was right behind him with 14. K.J. McDaniels came off the bench to score 11 points as well. It was awesome to see the youngsters finish off the game in the fourth quarter after being on a see-saw the entire time with the T’Wolves. This has probably been the biggest issue in terms of winning and losing for the team this year. The ability of a young team to finish off and put games away is a crucial part to the future success of the team. Its also a little crazy to see double digit wins already. We still have a little while to go before the end of the season so Hinkie might have to start making sure that win column is more to his liking come the season’s end. The Sixers get right back at it tomorrow as they play the eastern conference leading Hawks at WFC. Tip-off is set for 7:30.